The world of reality has its limits, but the world of imagination is boundless. 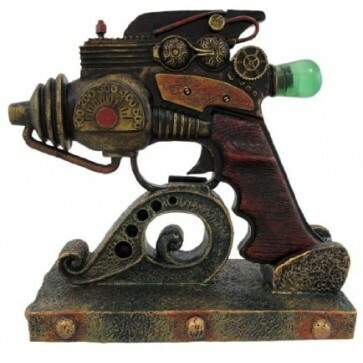 Let your imagination run wild with the Ray Gun Steampunk prop replica. Makes an excellent costume piece. For decorative purposes only, NOT a real gun/blaster, no active functions. Ray Gun is removable from its stand. 5 1/2" long, Made of hand painted cold cast resin.